Eli walks alone in post-apocalyptic America. He heads west along the Highway of Death on a mission he doesn’t fully understand but knows he must complete. In his backpack is the last copy of a book that could become the wellspring of a revived society. Or in the wrong hands, the hammer of a despot. Denzel Washington is Eli, who keeps his blade sharp and his survival instincts sharper as his quest thrusts him into a savage wasteland…and into explosive conflict with a resourceful warlord (Gary Oldman) set on possessing the book. “We walk by faith, not by sight,” quotes Eli. Under the taut direction of the Hughes Brothers (Menace II Society), those words hit home with unexpected meaning and power. Available on Blu-ray Combo Pack, DVD, On Demand and for Download 6/15! 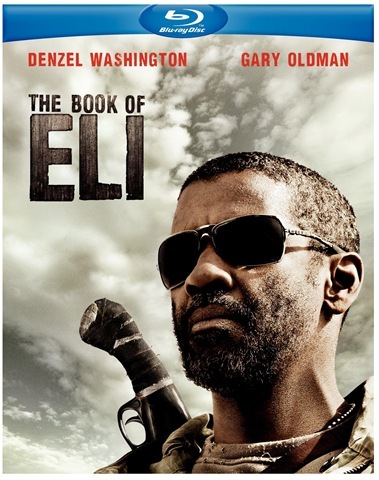 When I saw The Book of Eli in theaters, I have to admit I wasn’t all that impressed with the movie. I realize that the writers and the directors of The Book of Eli were trying to convey a positive message of one man’s survival through faith and from that the spiritual awaking of a corrupt and dying humanity. The biggest problem I had with The Book of Eli was that the warlord (played by Gary Oldman) was too cartoonish and over the top for the tone the movie was suppose to be setting. He failed to menacing and only served to add unintentional comic relief. I just didn’t find him to be a worthy villain to the noble and dedicated Eli. So it was with trepidation that I took on reviewing the release of the movie onto DVD/Blu_ray and digital combo pack. My overall opinion of The Book of Eli still hasn’t changed much, but I do have to say the special features that come with this release are well worth watching. I was particularly fascinated by the insertion of the extra in which you get to go behind the scenes with Denzel Washington and the Hughes Brothers to see how they crafted their post apocalyptic world in which Eli is a part of and gives the view an interactive chance to see how they would fare in such a world. This was an interesting aspect that made the actual movie a bit more interesting to watch. Being a bit of a history buff and someone who enjoys knowing how a creative concept of a story came about, I was also intrigued by the special feature titled ‘Eli’s Journey’. It was easy to get caught up in the historical and mythological themes that were used to base the extrapolation of The Book of Eli on. All in all, while the movie still grades a C+ for me, the special features on The Book of Eli grade at least a B+ and I think they make the combo pack release something worth watching. Previous PostBOOM! Studios Invades the 2010 ALA Annual Conference & Exhibition!Next PostHawthoRNe’s Second Season is Moving Onward and Downward!